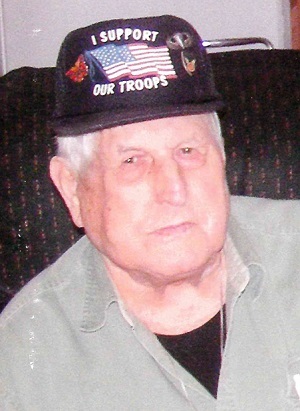 Edward E. Burst, 95, passed away December 4, 2018 at his home. He was born June 5, 1923 in Troy, Indiana, son of the late Frank and Antoinette (Hagedorn) Burst. Also preceding him in death were his children, Cheryl Freeman, Chris Burst, Mary Ann Cash, Mark Burst and Michelle Riley and siblings, Judith Rose Burst, Chuck Burst and Robert Burst in infancy. Before enlisting in the U.S. Army, Ed worked alongside his grandfather in his family’s logging business. He was a highly decorated World War II veteran receiving many medals and honors, including a Purple Heart and Bronze Star for his service to his country. After returning home, he married Doris Yvonne Weatherholt on April 14, 1946 and continued the logging business for over 50 years. He enjoyed horse pulling and had his own competitive team. Ed was also known for his friendly personality, enjoying visiting with family and friends. Ed is survived by his wife of 72 years, Doris Yvonne Burst; sons, Charles “Bud” Burst (Sandy), Cannelton, Jim Burst, Cannelton and Mike Burst, Tell City; daughters, Rosie Powers (Mitch), Hawesville and Carla Harlen, Tell City; 26 grandchildren, 37 great grandchildren and 6 great great grandchildren. Funeral services will be at 12:00 PM CST Friday, December 7, 2018 at Huber Funeral Home, Cannelton Chapel with burial in Greenwood Cemetery, where there will be military graveside rites conducted by VFW Post #2939. Visitation will be from 2:00 until 7:00 PM Thursday and from 10:00 AM until service time on Friday.